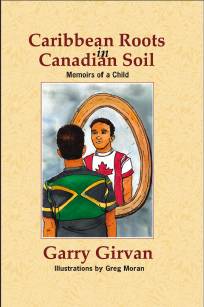 Caribbean Roots in Canadian Soil is the exploration of the uncertain childhood, adolescence and youth of the author, born in 1939 in Jamaica. It traces the journey of the child from his rural origins to his transfer to urban Kingston, his decade-long existence in Kingston and his emigration to Canada in 1955. Oshawa, Ontario of the 1950s – a time of significant change and tensions – is the backdrop to his integration into North American life. The narrative is well-supported by sixteen colour illustrations by the young and accomplished Victoria artist and illustrator Greg Moran. Greg also did the cover design. I've now read the book twice. It's an extraordinary book. You have a very special writing style that mixes imagery, social/historical content and context, feeling, and humour. My favourite pieces are those on Hurricane Charlie, for obvious reasons, and the near-fatal encounter between your crotch and the barbed wire fence that famous Sunday; which made me nearly fall out of my chair laughing. But the pieces that made the biggest emotional impact were those of trauma—your Grandmother's death and what followed; your departure from Jamaica; your reunion with your Mother, and your last letter to her, the terminal piece. What a treat to read something that resonates with my childhood. […] Your descriptions speak to me of a place in me that remains hungry much of the time. Because growing up in Jamaica is such an “odd” experience most people cannot write it, yet you have succeeded in getting on paper the Jamaican genius for finding a steady stream of wit and humour in the midst of human tragedy and sudden eruptions of violence from human and animal kind, be it the mad wasps or the inmates of Belleview.